At this school year's end, after teaching first grade for 17 years at Paynesville Area Elementary School, another chapter in Eileen Werner's life of service draws to a close. 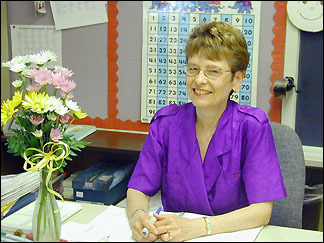 Eileen Werner discovered her love of children through her numerous experiences with young people. She found herself in a Paynesville classroom in 1974 after her husband Earl, who is a minister, was appointed to the Lake Koronis Assembly Grounds. She spent nine years as a teaching assistant in first grade. After her first five years working, her children were older and she began attending St. Cloud State at nights during the school year and full-time over the summer. In 1983, after her son graduated, she was hired as a first grade teacher. "I wanted to become more responsible for kids' learning - to have a more direct, positive impact," said Werner. At this school year's end, after teaching first grade for 17 years at Paynesville Area Elementary School, another chapter in her life of service draws to a close. After retiring, Werner plans to spend more time with her husband and continue volunteering at the elementary school. Her strong work ethic began to develop from her very earliest days as a farmer's daughter in rural Minnesota. Because there were no hired workers, she did chores and worked in the field like everyone else. She attended a one-room country school with students of all grades. She liked being able to listen to the lessons given to the older kids, so when she became their age she had a good idea of what it was she had to do. "We had the advantage of small class sizes," she said. Werner met her husband one summer while volunteering as a counselor at the same Assembly Grounds that later brought them back to Paynesville. They were married in 1961 and lived in the Twin Cities for two years. They then moved to Pipestone, where they started a family. Five years later they moved to Eyota, a small town outside of Rochester, where she volunteered alongside her husband. Her work included volunteering at an elementary school, as well as teaching Sunday School to developmentally delayed adults at the Rochester State Hospital. Werner has spent much of her life surrounded by children. While caring for their own two children, Werner and her husband also served as foster parents for adopted newborns. When she was volunteering at the elementary school in Rochester she would bring their current foster child with and the principal would enjoy playing with it while she was working with the school children. When asked her favorite thing to teach students, she answered without hesitation. "Reading is my passion. I like to turn kids on to reading," she said with a glimmer in her eye. One of the biggest challenges of her job is teaching students how to listen. "The hardest skill to teach is listening skills," she says. This has become increasingly difficult in just the last few years, said Werner. She feels children are used to the over-stimulation of flashing television and video games, and when they are put in a classroom setting they have difficulty concentrating on reading and listening. She says the media culture has also taught them to value things only for their entertainment value, which disregards other values - like learning. This makes teaching hard because students don't see a reason to pay attention if they're not being entertained. Werner tries to teach her students the difference between the fun that comes from entertainment and the satisfaction that comes from hard work and learning. "How long is fun going to satisfy you?" she asks. "The fact that you worked hard to accomplish a goal - that's going to satisfy you." One of the greatest joys of her job is seeing the progress students make in their writing. "It's fun to see the students come into first grade with a few writing skills and then end up writing stories at the end," she said. In her retirement, Werner plans to devote a little more time to her passion of reading and to do some summer gardening. "I want to learn to go slower and look at some things I haven't been able to do for a long time," she said. "Explore."